I know you remember that Guiltless Cauliflower Alfredo from the other day, right? Well, here's one of my favorite things to do with it. 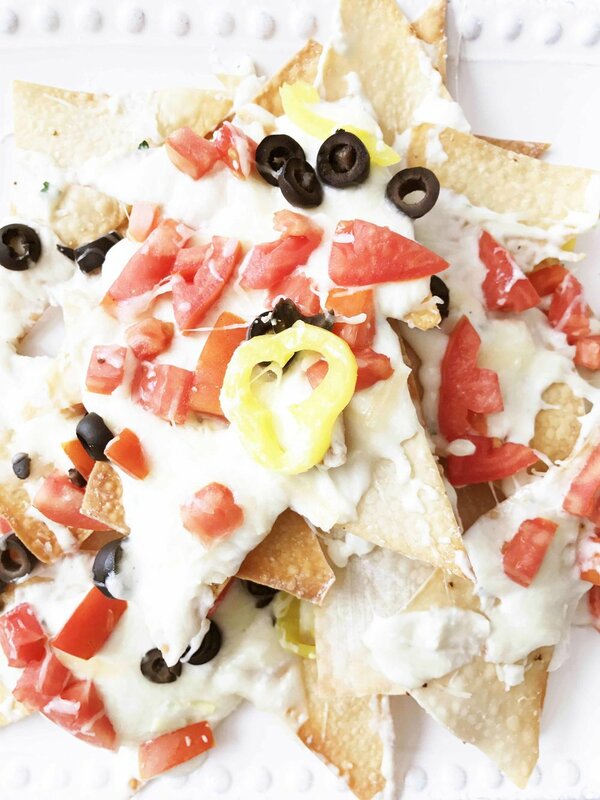 The idea for these Skinny Italian Nachos is a take-out fake-out from a big name chain. Of course, mine are homemade, not fried, and socked full of hidden vegetable goodies. Making all the more wholesome and better-for-you in almost every single way possible. I've left these nachos rather basic, with just the usual suspects as toppings so that you can feel free to add your own meat or protein if you want. Some grilled chicken, cooked Italian sausage, or even reduced sodium center cut bacon bits would be welcomed additions. The base of thees nachos is baked wonton skins. Why? Because they are similar to what a baked 'pasta chip' would be like and gives you that 'nacho' feel. Thin and crispy while also being substantial enough to hold up to alfredo and toppings. 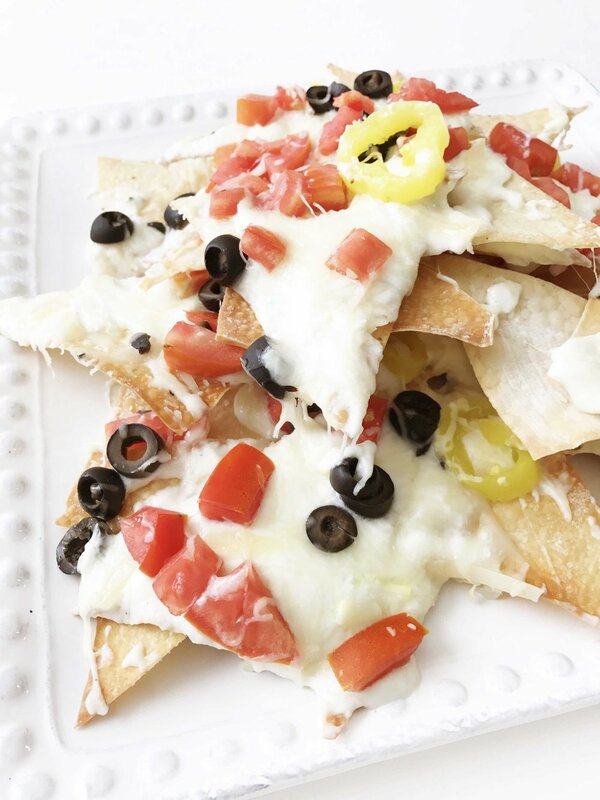 These Skinny Italian Nachos are great as a meal in themselves, as a starter for an Italian style meal, or even as part of a game day spread or family style gathering. 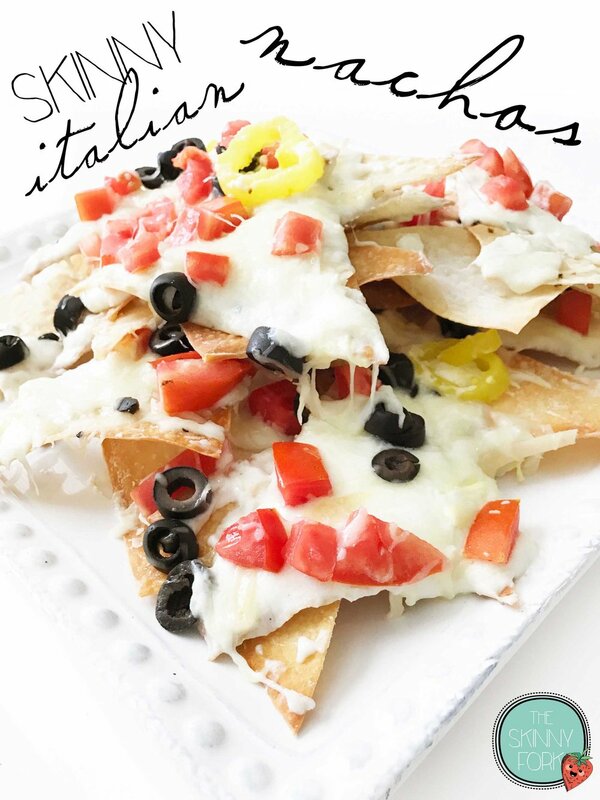 This is a super fun way to put an Italian twist on a tex-mex favorite. Preheat the oven to 350 degrees F. Cover a baking sheet with non-stick foil or baking mat and lightly coat it with non-stick cooking spray. Lay out the halved wonton skins in a single layer and lightly coat them over the top with a bit of non-stick cooking spray; season with salt and pepper. Place the pan into the oven to bake for 10-15 minutes or until the wonton wrappers are crisp and turning golden brown on the edges. Repeat for the remaining wonton skins until they are all baked. Pile the 'pasta chips' up on the same baking sheet. Reheat the 1/2 Batch Guiltless Alfredo if needed and spoon it over the top of the pasta chips. Top with the 1/4 C. Reduced Fat Shredded Italian Cheese Blend, a can of Sliced Black Olives, 1 Medium Tomato, and 2 Oz. Sliced Pepperoncinis. Place the baking sheet back into the oven for about another 5 minutes or until the cheese has melted. Once done, remove from the oven and divide evenly among plates. Enjoy right away!